Rocky Mountain National Park is not known for prolific aspens stands such as are found in the western portion of the State of Colorado. The Bear Lake area of Rocky Mountain is an exception to this rule. A man made forest fire from a picnic gone awry near Bear Lake in the 1920's caused many of the Pines in the area to burn. These burned areas were re-populated with Aspen groves. In this view, the Aspens along Bear Lake Road are displaying their fall color as light snow and fog sifts through the trees. Even as snow fell on the forest this day, there was little wind and little traffic along Bear Lake Road. 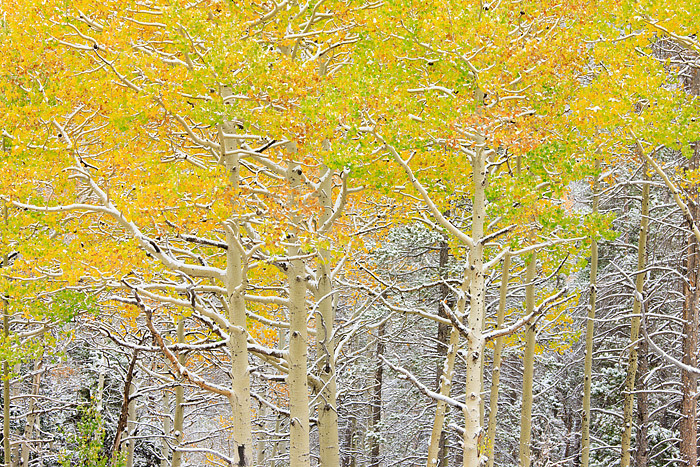 This made for a serene experience as light snow fluttered down on the brilliant yellow Aspen trees. Photo © copyright by Thomas Mangan.